Mercy Place East Melbourne hosted a ‘doggy play date’ for residents, families and staff earlier this month, to mark the start of Alzheimer’s Australia’s Dementia Awareness Month. The theme for this year’s Dementia Awareness Month, which runs throughout September, is You are not alone. Mercy Place East Melbourne decided to put its own spin on this by hosting the special ‘play date’. Stars of the show included a french bulldog, cavoodle, beagle and pomeranian. Research shows that pets in aged care reduce tension, fatigue and confusion, as well as increasing enthusiasm and interest, and greatly increase quality of life for residents. 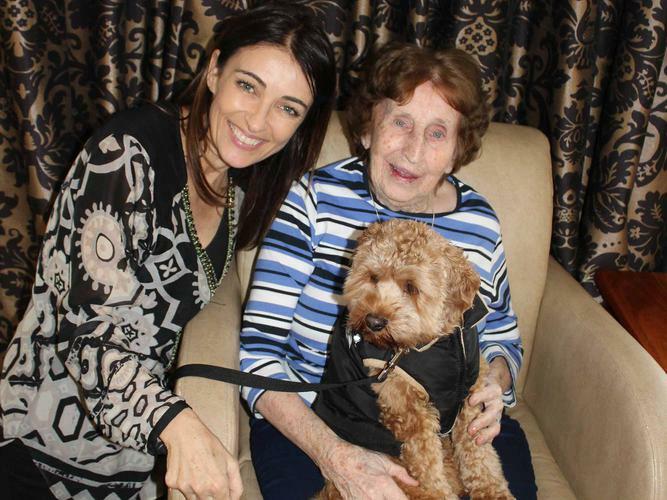 Pets are also an important feature of Mercy Health’s Model of Residential Aged Care. “I think everyone at every stage of life deserves the joy, companionship and love that pets inject where ever they go,” says celebrity vet Dr Katrina Warren, who was a special guest at the event. Kevin Mercer, Chief Executive Aged & Community Care says every Mercy Health aged care home either has a live-in pet or receives regular animal visits as part of the organisation’s Model of Residential Aged Care.